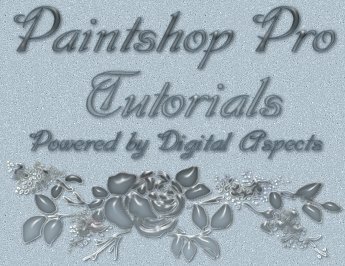 Welcome to my tutorials for the program Paintshop Pro. Most of the tutorials here were hand made in Paintshop Pro. They took a considerable amount of my time to bring these to you for a learning experience. I will not lower myself to placing a no right click code, or encript my tutorials to protect them. We need to agree on a few things before you attempt any of the tutorials here. 1. You are not to copy any part of these tutorials to upload to your server. 2. You are not to claim any of them as your own. 3. If you want to send the url through an email list you must contact me first. 4. You will not send the tutorial as a whole through any list for any reason. 5. You can download to your harddrive for the sole purpose of doing them offline. 6. You can also place them on disk or CD for back-up purposes only. If you agree to the terms list above then you may go onto the tutorials otherwise please use the back button. Please don't make me resort to placing them on CD and charging for the purchase of said CD. Or creating a membership only site to access the tutorials. in any way, in any media including email lists.